Present state: Station building has been converted into a pub called the Cheshire Lines Tavern. Extensions have been added to the original building but in a sympathetic manner. Notes: Cheadle was located on the Glazebrook East Junction to Godley line of the Cheshire Lines Committee (CLC) which opened from Stockport Portwood to Deansgate Junction on 1 December 1865. Godley was a junction with the Manchester, Sheffield & Lincolnshire Railway’s (MS&LR) Manchester and Sheffield ‘Woodhead’ route. The CLC was a joint company of the Great Northern Railway (GNR), the MS&LR and the Midland Railway (MR). The line from Stockport to Deansgate Junction had originally been promoted by the Stockport, Timperley & Altrincham Junction Railway, which had become part of the CLC on 5 July 1865, to connect the Woodley and Stockport line with the Cheshire Midland Railway line (which linked Altrincham with Mobberley and was also absorbed by the CLC, and later extended in stages to Chester). The final section of line, creating the Glazebrook and Godley route, opened on 1 March 1873 between Skelton Junction and Glazebrook East Junction. forming the larger pavilion, whilst the other was single-storey one was linked to it by the entrance hall and ticket office, where a swept-down roof covered a waiting area on the platform. A single-storey wing projected eastwards from the main office block, set back from the platform. The stationmaster’s house included a ground-floor bay window. The roofs were enlivened by alternating bands of plain and fish-scale slates. Perhaps the most charming feature of the building was the elaborate fretwork of the gable bargeboards which appeared in different patterns at CLC stations. The frontage of the station was also attractive and similar to the platform elevation, including the swept-down roof sheltering the entrance. 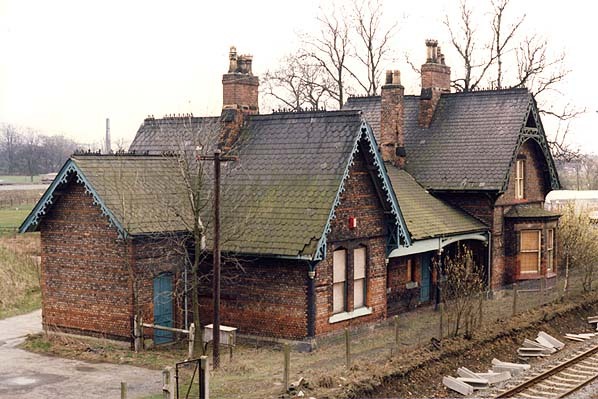 On the ‘up’ platform (north side of the line) was a substantial brick waiting shelter with slate roof. On the up side of the line to the north of the platform, and built in similar style to the station, were two houses for railway workers in the form of a semi-detached block. The signal box was at the west end of the up platform. It controlled the main line through the station as well as access to the station goods yard which was located west of the station, south of the line. The goods yard had two sidings, a goods shed and a 5-ton lifting crane. There was also a single siding on the north side of the line. At the time of opening Cheadle station would have been served by local trains running between Godley and Altrincham (or points along the Mobberley line). With the introduction of passenger services onto the Glazebrook line on 1 August 1873 the station would also have been served by trains between Liverpool and Stockport. Express passenger services would also have run through the station from this time operated by the constituent parts of the CLC. The MR operated expresses between Liverpool Central and London St Pancras whilst the GNR ran services from Liverpool Central to London Kings Cross. The MS&LR ran through trains between Hull and Liverpool Central. The goods services on the line were equally, if not more, important. As it avoided Manchester the heavy coal traffic of the MS&LR between Yorkshire and the port of Liverpool was routed via Cheadle. A constant stream of coal trains passed through as did a variety of other merchandise. The route became one of the busiest double-track lines in the country for goods services. In 1876, as part of the installation of a signalling ‘Block System’, the signal box at Cheadle station was replaced with a brick CLC type St/CL2 structure containing a 25-lever frame. By December 1895 Cheadle was served by twelve passenger trains on weekdays as shown in the table below. On Sundays there were three trains to Godley and two to Liverpool Central. On 1 August 1897 the MS&LR changed its name to the Great Central Railway (GCR). On 15 March 1899 they opened their own main line to London Marylebone and became the third of the CLC partners to run direct services between the capital city and Liverpool via Cheadle. On 1 July 1902 the MR opened a new line from Heaton Mersey to New Mills to accelerate their express services between Manchester and the south. The new line passed over the Glazebrook and Godley line just under a mile east of Cheadle station. A connecting spur was put in from a new junction (Cheadle Junction) 64 chains to the east of Cheadle station to the new line at Cheadle Heath to allow express services between Liverpool and the South to be accelerated. Local passenger trains serving Cheadle station did not run over the new line and continued to run eastwards via Stockport Tiviot Dale. By July 1922 Cheadle had a slightly improved passenger service with nine calls in each direction Monday to Friday as shown in the table below. There was no Sunday service at this time. At the grouping of 1923 the CLC remained independent but its parent companies became part of the London Midland & Scottish Railway (LMS) which held one third of the shares and the London & North Eastern Railway (LNER) which held two thirds. The LNER provided the motive power for the local CLC services. In 1929 the CLC acquired four steam rail-motors of LNER design, and they were used on the Stockport Tiviot Dale and Altrincham service until it was withdrawn in 1931. After that they sometimes appeared on Stockport Tiviot Dale and Liverpool Central services. The LMS summer timetable for 1932 showed Cheadle as having a very poor service with only four westbound calls on Monday to Friday and three on Saturdays which either ran direct to Liverpool Central or provided a connection. Eastbound there were only three services to Stockport Tiviot Dale. There was no service on Sundays. At nationalisation on 1 January 1948 Cheadle became part of the British Railways London Midland Region. The British Railways summer timetable for 1948 showed five eastbound and four westbound services Monday to Friday as shown below. There were retimed eastbound services and two extra westbound services on Saturdays, but there were no Sunday trains. On 1 July 1950 the goods depot at Cheadle station was renamed Cheadle North. The line was extremely busy with over 200 trains passing through Cheadle every day, most of them being goods services. With the completion of the electrification of the Woodhead route in June 1954 it became the main avenue for coal traffic between Yorkshire and Merseyside. The local passenger service did not improve over the next decade. The summer 1962 timetable showed the first eastbound departure at 1.20pm. There were then only two other eastbound departures, and all went to Stockport Tiviot Dale. Going west there was a departure for Liverpool Central at 7.39am and then only two other services Mondays to Fridays both of which terminated at Warrington Central. On Saturdays there were five westbound services: three went to Liverpool Central and two to Warrington Central. With such a poor passenger service it was not surprising that the Reshaping Britain’s Railways (‘Beeching’) report of 1963 recommended withdrawal of local trains between Stockport Tiviot Dale and Warrington Central/Liverpool Central. The formal proposal of closure between Glazebrook and Stockport Tiviot Dale was published on 12 July 1963. Cheadle North goods station closed on 7 October 1963. The Minister of Transport consented to withdrawal of passenger services on 11 September 1964 and closure took place on 30 November 1964. The signal box closed on 21 November 1965. Whilst the box was demolished the station buildings were spared. The last regular express passenger services ran through Cheadle in 1966. The line through Cheadle remained a busy freight route. The opening of Fiddlers Ferry power station, near Widnes, in the late 1960s provided additional traffic. Coal for the power station came over the Woodhead route to Godley where the electric locomotives were exchanged for diesels which took the coal forward. These trains, along with those carrying coal for Garston and Partington, as well as oil, stone, liquid oxygen and many other types of traffic continued to pass through Cheadle until 16 December 1980. Damage to a tunnel at Stockport, caused by the construction of a motorway, blocked the line, and trains were diverted along other routes. The 1902 spur onto the former MR line had remained open (as had the line from Cheadle Junction to Hazel Grove) and the ICI stone trains continued to use that route passing through Cheadle, which had become derelict by this time. However the volume of traffic was far less than it had been. On 18 March 1984 British Rail officially closed the route from Stockport Portwood to Cheadle Junction, and it was lifted. use up line was lifted. 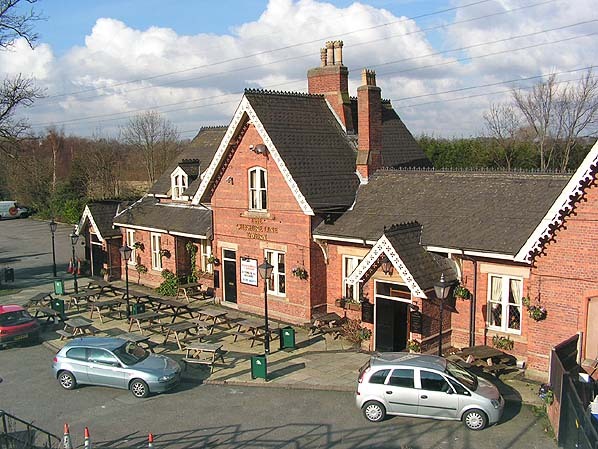 In the late 1980s the main station building was converted into the Cheshire Lines Tavern - a pub and restaurant. The restoration was sympathetic, and although extensions were added to the building they blended with the original structure. The Cheshire Lines Tavern was still a thriving business in July 2012 and freight trains continued to pass by. The former railway workers’ houses were also present in private ownership. Looking north towards Cheadle station in 1910. The station building is clearly seen and beyond it the railway houses that were built in the same style. Cheadle as seen on a 1910 map. Cheadle lookiing east in 1939. Standing at the down platform is one of the CLC's four railmotors that had been introduced in 1929. Built by Sentinel as part of a batch of 53 (49 went to the LNER) the railmotor were the only form of motive power that the CLC ever owned. The company owned coaches and wagons but never owned a locomotive. The railmotor seen in the picture was probably opering on a Stockport Tiviot Dale to Liverpool Central service. Between 1929 and 1931 railmotor had been used on the Stockport and Altrincham service. Looking west at Cheadle in 1946. The picture gives a good view of the layout of the station and the goods yard beyond it. Also in the view is the Cheadle Station signal box. A coal train is seen heading west through Cheadle station in the early 1960s. At this time only a handful of passenger services called at the station but hundreds of goods trains every day passed through. Cheadle station looking east in May 1976. The station was in use at this time as a private residence. The line itself was still a busy freight artery seeing a variety of traffic including coal, stone and oil. Cheadle station forecourt in February 2006. By this time the station had been sympathetically converted into the Cheshire Lines Tavern. Cheadle station looking north-east on 15 March 2011. Looking west at Chedle station on 1 July 2012. The line through the station remained open as a route for freight trains between Hazel Grove and Northenden Junction.The line had become single on 15 July 1984 with the redundant 'up' line being lifted in the early months of 1986.